So why have I not updated my WP? Well, I was a little lazy because my host does not have a one-click install/update, but it really started out just as a joke, to see how long I could hang on to a decrepit old version of WP. It turns out the joke is on me because now that I’ve let things go too far, I might lose the look of my site if the site is upgraded. (I love my design!) If I start over, I’ll lose the comments because I can’t export this site. 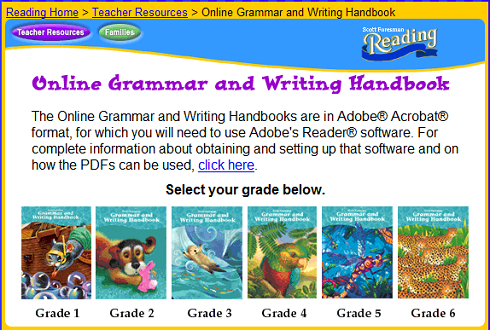 Scott Foresman offers a free grammar & writing curriculum for Grades 1-6. There are separate handbooks for each grade and they are all in pdf format. The Daily Grammar lessons consist of 440 lessons and 88 quizzes. Lessons 1-90 cover the eight parts of speech, which are verbs, nouns, pronouns, adjectives, adverbs, prepositions, conjunctions, and interjections. Lessons 91-300 cover the parts of the sentence, such as appositives, predicate nominatives, direct objects, prepositional phrases, clauses, and verbals. Lessons 301-440 cover the mechanics of grammar, which is also known as capitalization and punctuation. You can download the Daily Grammar Lessons eBook for $6.95 USD or purchase the Daily Grammar Lessons eBook on CD – $10.95 USD. The lessons are archived here. Sheppard Software offers HUNDREDS of online educational games. Their Geography games are particularly awesome but there are many other activities for Science, Math, History and Language Arts. They aren’t just for kids! There is a little something for everyone from pre-schoolers to adults!